Sink into hard-to-handle light materials or farm materials with the bite of the utility grapple attachment. The utility grapple offers the additional holding ability necessary to bite down on even the loosest materials. Designed with efficiency in mind, the compact design of the utility grapple gets the fork or bucket close to fences or the sides of stalls for maximum material moving. Choose from a fork and grapple, or bucket and grapple to handle a wide variety of farm and ranch jobs. 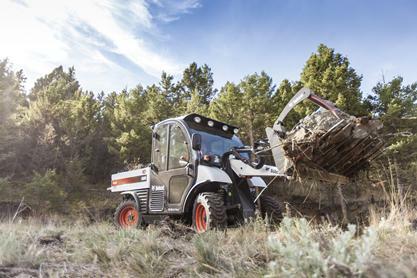 Whether home on the range or down on the farm, the utility grapple sinks in to get the job done. Curved Teeth: Help pull materials into the grapple, scooping up even the loosest material. Also, teeth are replaceable for added uptime protection. Forged Teeth: Provide exceptional strength with low weight, allowing for more carrying capacity.